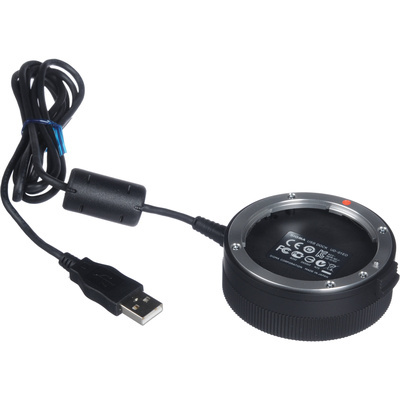 Product #21196 | SKU 878954 | 0.0 (no ratings yet) Thanks for your rating! The Sigma USB Dock allows you to connect your Sigma Global Vision lenses to your computer in order to update firmware and adjust focus setting parameters using the Sigma Optimisation Pro software. This dock is only compatible with the Sigma Art, Contemporary, and Sports line lenses featuring a Canon EF lens mount. Once a Sigma Art, Contemporary, or Sports line lens is connected, you can use the Sigma Optimisation Pro software to configure focus settings and update lens firmware. For all lines of lenses, there are four categories for prime lenses and 16 categories (four options for focal length, four options for shooting distance) for zoom lenses available. These categories allow you to set certain focusing settings to better suit your personal shooting style. If using a Sports line lens, additional lens configurations are available: three different AF speed modes to modify how quickly the lens changes focus; the ability to constrain focus distances within a specific range to suit your personal shooting habits; and three Optical Stabiliser modes to suit the manner in which you are shooting.